Lynx Grills have consistently remained at the top of the luxury outdoor equipment manufacturers. These grills are made in the USA of high quality materials. Sometimes parts in the grills will corrode over time. These frequently include burners, cooking grates, briquette trays and ignition. Replacing parts in your Lynx grill is not as daunting a task as you may think. Virtually every part is still available even in their introductory grills. In order to identify the correct parts for your grill, it is important to not only know your model number but your serial number as well. This is because these grills have made many design improvements over the years while keeping the model numbers the same. Thus, making it difficult to identify parts on model alone. Having your serial number allows us to be completely sure we are ordering the correct part for your grill. There are over 12 different series in the Lynx line of grills. Two series in the Premier Grills and ten in the Professional Grills. The Premier series consists of series 0, 1 and E and they have models that begin with LBQ. The Professional series also consists of E but in this series, the model numbers begin with L. There are also F & G, H, J, K, L, M, N & P and Q. Most of these design improvements lie in the ignition system, hood , sear burner and briquette trays. The brass burner has remained consistent throughout the years. The following are the Parts Schematics for each of the Lynx Grill Series. The Premier series 0,1 were the introduced the Lynx Grill into the marketplace. They were one of the first true luxury brand grills. There were three models in this series LBQ27, LBQ36 and LBQ48. The first group of grills in the Professional Series is the E. Note: There is an E in the Premier series but the models in that group start with LBQ. 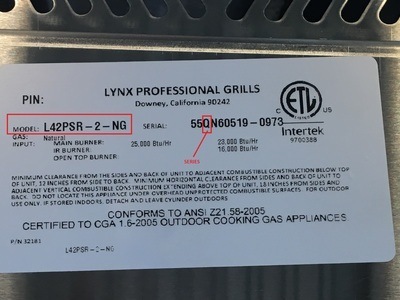 To determine if your grill is in this series, your model number will start with an L and the third digit in the serial number will be a E.
The Lynx E Series Grill included models L30, L42 and L54. The L30 models have 2 burners, the L42 have 3 burners and the L54 have 4 burners. These grills used a battery operated igniter that has a battery holder on one or both sides if the grill, depending on the model. Below you will find a schematic of the grill that will aid in ordering replacement parts. The second series in the Professional line is the F&G. This series included a model line up of L27, L30, L36, L42 and L55 which still remain today. The L series introduced yet another ignition design, the glow plug hot surface ignition. This still exists in current models. If you need any assistance, call The BBQ Depot at 877-983-0451. We are authorized warranty and service agents for Lynx Grills. Once you have located the part you need, you can search the part number in the search box at the top of our website. If we do not list the part online, give us a call at 877-983-0451 or email us at info@thebbqdepot.com and we can locate the part for you. As a Lynx service dealer, we have access to every part.